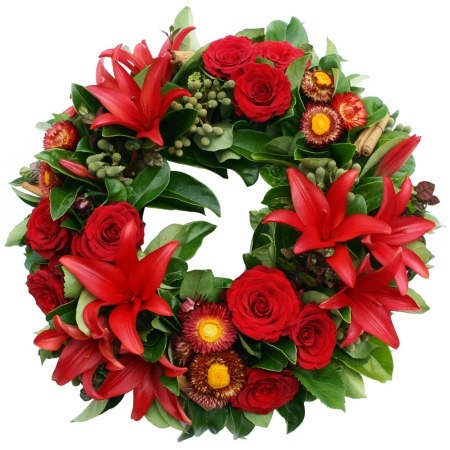 Simply place your order of Christmas flowers online and have our talented florists design a wreath bursting with fresh and bountiful blooms in rich reds, accented with lush green foliage. Exotic Asiatic lilies dance with red roses and warm-toned paper daisies nestle amongst berries in this luscious floral centrepiece. A sweet little bundle of cinnamon sticks adds a touch Christmas spice to this gorgeous flower arrangement. A delightful table centrepiece, this wreath looks spectacular with a glass candle votif in the centre.